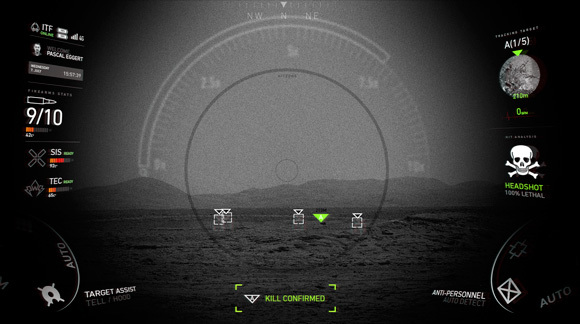 A weapon that can hit any target needs a scope that can find any target. 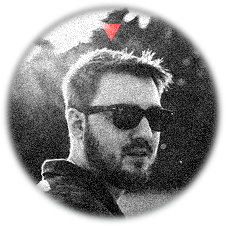 Take a look at the ITF-Scope, the most intelligent targeting system in the world. The ITF automatically detects and tracks targets by comparing silhouette, speed, size, heat signature, position and other factors to an integrated database and sorts them by distance. If a wireless network is available, the ITF can also perform a websearch to compare targets by facial detection to online results. 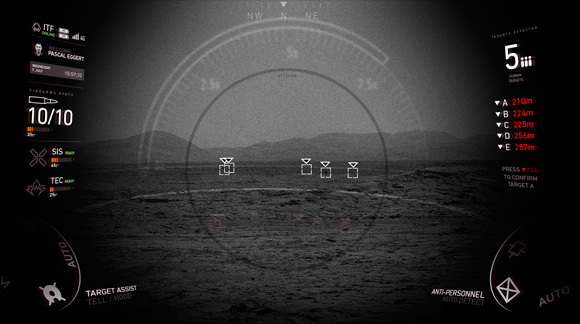 By pressing the “TAG” Button in front of the trigger, the target closest to the center of the viewfinder is selected and the path for the SIS-Barrel is calculated in realtime. Depending on target distance the ITF aims for headshots or center mass and calculates the chance of an instant kill. 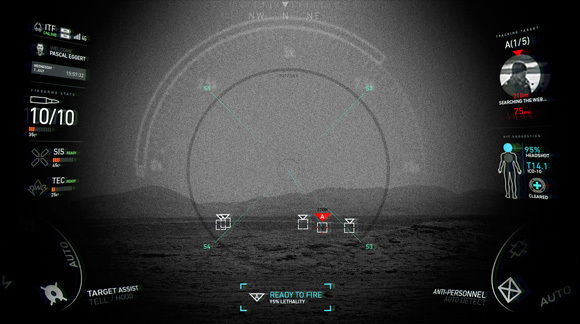 After firing, the changes in position, heat signature and heartrate are compared to confirm if the target was successfully terminated. Pressing the “TAG” Button again will select the next target. Alternatively you can use group shooting mode automatically fire at all marked targets with a single press of the trigger. The ITF records every fired shot as a short videoclip on an internal storrage. 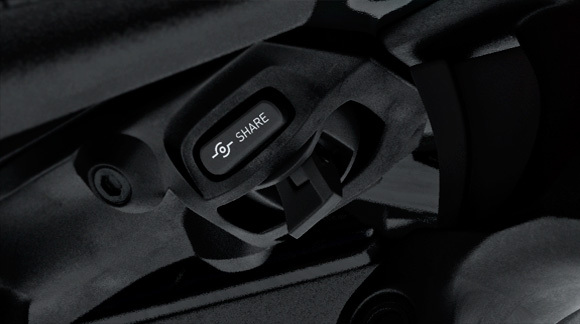 Videos can be shared to other devices through a single press of the share button near the trigger of the EPIC A3. To achieve repeatable performance and unprecedented accuracy even at extended ranges, the ITF is packed with so much technology, it's technically not a scope, but a mobile computer that just happens to look like a scope. But unlike office computers, the ITF is engineered to withstand drops, spills, dust and grime and to perform even in the harshest environments. Many internal electronic components are triplicated for above milspec fail-safe redundancy and the entire system can be powered from up to three different power sources inside and outside the case. The ITF is equiped with a state of the art HD camera above the ocular lens to detect verified users by biometric identification through Iris recognition and activates the ITF only when needed. A battery free reflex sight red dot can be projected into the scope in case of a power-outage and even in case of a total system failure the ITF can be aimed with front and rear backup fiber optic BUIS iron sights. The main objective lens of the ITF is accompanied by four high sensitivity image sensors for night vision, heat detection, range measurement and video recording, all feeding into the ITF main targeting processor. On the bottomside of the ITF is a waterproof micro- USB 3.0 port for charging, plugging in accessories, transfering videos to a computer or uploading firmware updates. The TELL Engine runs inside the ITFs main targeting processor and calculates the best trajectory for a projectile in realtime, taking into account gravity, distance, temperature, weather, wind and earth rotation. The ITF hosts it’s own WIFI Server to communicate with other ITF equiped rifles and ITF compatible devices and can be used to stream a live view from the viewfinder to computers, smartphones and tablets. Please don’t shoot me with an EPIC A3. Or any other weapon really. Thanks.